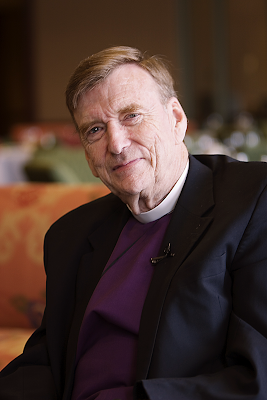 The Right Reverend John Shelby Spong, retired Bishop of the Episcopal Diocese of Newark, as a writer, challenges pretty much everything which passes for traditional Christian thought. He's been banned by no less than the (very conservative) ArchBishop of Sidney. (What the ban consisted of I don't remember and just don't give a damn enough about to bother finding out.) I've read a number of his books, many of his essays. Like Alan Watts before him, his writing changes my understanding of what Christianity is. Liberal theologian, biblical scholar, religious commentator and author, the Reverend Spong is a good and extraordinary human being. In the below essay Reverend Spong leads us towards if not compassion (what he unquestionably would hope of us), then at least understanding of the rage which seems to well up inexhaustibly from within the religious right. Want to really get me going? My oldest daughter can get me genuinely angry faster than anyone on earth. Except perhaps my own Dad. We have Anger. More accurately, Anger has us. What hopefully separates we liberals from the religious right, is a genuine willingness to engage in authentic self-reflection. Want to win elections? Understand the enemy; understand yourself. Reverend Spong speaks as one who knows. Pay attention please. One of the things that always surprises me is the level of anger, often expressed in acts of overt rudeness, which seems to mark religious people. It appears so often that I have almost come to expect it, or at the very least not to be surprised by it. A recent episode simply made the connection between religion and anger newly indelible in my consciousness. It occurred last spring when I attended, at their invitation, the graduation ceremonies of a well-known university. Indeed, I was to receive an honorary degree. There was much conviviality connected with this event. We were entertained royally by the president of the university and his wife. We saw former classmates. Families gathered to share this transitional moment with a graduating son or daughter. It seemed to be a very pleasant occasion. When the procession formed to begin the ceremonial walk into the arena, there was a panoply of color marking the assembly. The black caps and gowns of academia were bedecked with bright and varied hoods, representing the doctorates earned by the members of the faculty and reflecting the school colors of the awarding universities. Harvard's crimson was immediately identifiable, as well as the unique form of the doctoral hoods from the storied universities of Cambridge and Oxford. My place in this lineup was in the company of some of the university's deans. While we waited for the signal to begin the procession, I introduced myself to my nearest companions. They were all cordial until I introduced myself to the Dean of the Medical School. It was not a time for small talk for this man. He could not have possibly known that he and I would be together in the procession, so what followed was clearly spontaneous and unplanned. He obviously had strong feelings about me and could not miss this exquisite opportunity to give expression to them. I had never met this man before this moment, but my expectation was that one whose career in medicine had been so successful that he had become the dean of a major medical school would have a broad perspective on life. I was wrong. He was bitter and small-minded, caught more in his narrow religious agenda than in his academic excellence. We had barely unlocked hands in our introductory handshake when he said, "I wish I did not feel this way but I think what you have done to the Church is both reprehensible and destructive. I regret that this university has decided to honor you today." I was taken aback not by the content of his remarks, since I have dealt with threatened religious people many times before, but by the inappropriateness of his comments. This was neither the time nor the place for this tirade. I was after all an invited guest in his world. Yet, he simply could not contain his feelings. I tried to parry his comments by saying something like: "I'm sorry we don't have time to discuss this here, but you must realize that the world has undergone a vast intellectual revolution in the last 500-600 years and if the Church is to stay in dialogue with that world then the Church must also change. However, this Dean was in no mood to let go; he had the bit between his teeth. "You totally ignore the truth of those first 1,300 years of Christian history," he retorted, his anger still rising. "Would you want to practice medicine in today's world equipped only with the medical knowledge available in the first 1300 years of Christian history?" I enquired. At that moment the conversation ended because the music started, the stately procession began its journey into the stadium where literally thousands were gathered. As we walked in silence I could not help but wonder at the rudeness of this Dean, who had so great a need to express his anger that he violated the good manners of his university. I learned later that this doctor was part of a conservative Christian congregation. Somehow, religious convictions seem to give people permission to be rude. A similar incident occurred in the summer of 2005, when I was the guest lecturer at the Highlands Institute for American and Philosophical Thought in Western North Carolina. I had been there for the past three summers, and had always met with a warm and positive reception. However, on this particular night, a local fundamentalist decided to achieve his fifteen minutes of fame. About midway in the lecture, this man stood up and drew sufficient attention to himself that I stopped speaking and enquired if there was something wrong. "I'm feeling sick," this gentleman replied. So I responded, "There is nothing I'm saying tonight that is more important than your health, so let me pause until you get whatever help you need." "You don't understand," he retorted, "I'm sick of you." Somehow this man felt that his religious convictions justified his interruption of a lecture attended by more than 250 people. It never occurred to him that this behavior was rude to me, rude to the audience and that it reflected little more than his own anger. I learned later that he was a member of the Community Bible Church and that he had been encouraged to take this action by fellow members of his fundamentalist church. Once again if one is acting 'in the name of God,' both anger and rudeness are apparently justified. Those two experiences set me to thinking about the relationship between religion and anger. It is far closer than most people seem to realize. Sometimes the sweet piety of religion serves to hide anger even from the awareness of the angry one, though it is obvious to everyone else. Is it anything but anger when religious people describe what is in store for those who do not believe their way? Is the threat of hell, which is spoken so freely in religious circles, not a projection onto God of the anger inside the one consigning another to a place of eternal torment? Is there much difference between a person saying in hostility: "Go to hell!" and a preacher threatening a congregation with that same destiny? When one looks at the history of religious persecution, which has included such things as excommunication, torture, and the burning of heretics at the stake, there is ample evidence of hostility associated with Christianity. When one adds to that the Crusades designed 'to kill the infidels,' a history of anti-Semitism, and the wars between Catholics and Protestants, the picture of religion as a source of anger in human society, victimizing people in every generation, becomes clear. In moments of social upheaval, religious anger becomes very apparent. Most of the anger that was displayed during the movement to emancipate women came from the Christian Church. Most of the anger displayed in the current struggle over justice for gay and lesbian people emanates from the Christian Church. It is very hard to deny that underneath the sounds of religious conviction, there is a boiling cauldron of anger that seems to be an unrecognized part of the religious experience. Step one, therefore, is to recognize it. Step two is to understand it. Religious anger seems to manifest itself first and most stridently in those religious traditions that claim to possess absolute certainty. It is only when one believes that one possesses the whole truth of God that one finds the need to persecute those who do not accept your version of truth. What that behavior reveals is that the frightened human psyche needs the certainty of religion, no matter how narrowly defined, in order to feel secure. Christianity has developed many security-giving idols inside its traditional formulations, infallible popes and inerrant scriptures being two of them. How rational, for example, is it for anyone to say: "Since my God is the true God and your God is, therefore, a false God, I have the right to hate you, to persecute you or even to kill you?" Yet all of these expressions of anger are found inside the Christian Church. The second thing that religious anger reveals to me is that organized religion feeds the expression of self-hatred in its people. There is certainly much self-negativity in traditional Christianity with its doctrines of 'the Fall,' its emphasis on the depravity of human life, the need to be rescued, and the guilt-producing idea that "Jesus died for my sins." The liturgies of Christian churches are constantly calling their worshipers such things as 'a wretch,' 'a worm,' 'one unworthy to gather up the crumbs under the divine table,' all interspersed with the plea to God to 'have mercy, have mercy, have mercy.' Are these not expressions of self-directed religious anger? If one absorbs negativity from any source long enough, one cannot help but become negative. When one is denigrated in worship over a sustained period of time, one inevitably projects this denigration onto others as anger. It is necessary for survival. Does this not help us to understand why prejudice is greater among religious people than among non-religious people; why slavery, segregation and other overt forms of racism have been the pattern of that region of our country that we call 'the Bible Belt;' and why the 'Religious Right' even today is more supportive of war as an instrument of national policy than any other segment of our national population? Each of these attitudes reflects religiously justified violence. Has religion in general and Christianity in particular degenerated to the level that it has become little more than a veil under which anger can be legitimatized? What happened to that biblical proclamation that the disciples of Jesus are to be known by their love? How does religious anger fit in with the Fourth Gospel's interpretation of Jesus' purpose to be that of bringing life more abundantly? Perhaps the time has come to recognize that Christianity was never meant to be about religion; it is to be about life. The achievement of personal security is the goal of religion. The ability to live with integrity in the midst of the insecurity of life is the goal of Christianity. Religion seeks to control life with guilt. Christianity seeks to free people to be all that they can be. There is a vast difference. Perhaps it will take the death of religion to open us once again to the meaning of Christianity, even 'Religionless Christianity.' For the purpose of Jesus was not to make us religious but to make us fully human.